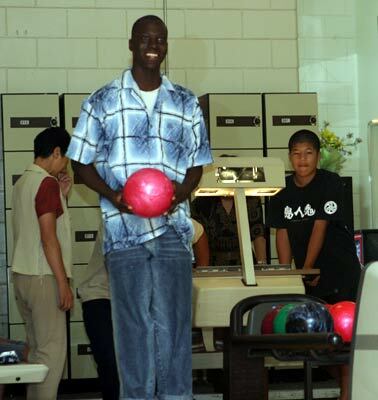 CAMP HANSEN, OKINAWA, Japan — With the finesse of Fred Flinstone and grace of Professional Bowler’s Association Hall of Fame bowler Pete Weber, a 13-year-old Okinawan student sends a bowling ball down the lane, hoping for his third strike in a row. The Okinawan and American audience holds its breath as the ball slowly moves down the lane. Shouting, hugs and smiles fill the facility as all 10 bowling pins fall. This “turkey” occurred at the Striker Bowling Center here Aug. 16 as 10 Okinawan students from Hama Junior High School and 11 Marines with 9th Engineer Support Battalion gathered for an afternoon of excitement. The Marines and Okinawan students participate in fun activities each month to help strengthen their relationship and reinforce English language skills, according to Lt. Steven Orren, the 9th ESB chaplain. “We have had an ongoing relationship with the school since last year when we brought a Thanksgiving meal to them,” Orren said. Most of the Okinawan students have never been on a Marine Corps installation, Orren explained. Bowling allowed the students to work on their English vocabulary. The Okinawans had to constantly talk to the Marines about their bowling techniques and score sheets, according to Orren. “I will never forget how the Marines taught me to keep score,” said Yugo Sinzato, a 13-year-old Hama Junior High School student. The Marines and students bowled two games together and encouraged each other throughout each game with “high-fives” and pats on the back. “I think the Marines are very kind,” Sinzato said with a smile after the event was finished. Some Marines were surprised at how well the Okinawan students bowled. “These kids were kicking our butts,” said Lance Cpl. Reginald St. Louis, a bulk fuel specialist with 9th ESB. After bowling, the group ate lunch at The Palms enlisted club here to give the students a taste of American cuisine. The event has given the Marines and students an expanded view of the world, according to Orren.